Answer this: What is design to you? That’s a pretty open-ended question, but that’s Professor Erin Huizenga’s intention when she asks her 60 MMM students the first day of class. In Communication Design, Huizenga exposes students to the basic elements of graphic design and visual narrative. Students experiment with grids, typography, color theory, Gestalt principles and visual framework. Huizenga stresses the importance of knowing the fundamentals first. “You have to learn the rules of the road, then you can play with them and make them your own,” Huizenga said. The course focuses on design as a craft by learning hard skills on Adobe Creative Suite, but Huizenga also encourages students to take their design a level further by thinking about visual hierarchy. “This class is super refreshing, because it forces you to think differently,” MMM student Salman Somjee said. During the course, the class partners with a local nonprofit for whom they design posters. This summer students worked with Urban Gateways, a nonprofit that educates Chicago’s youth through high-quality, accessible arts experiences. Huizenga finds the clients through EPIC, a nonprofit she founded six years ago that brings creative professionals together to work for eight weeks with low-budget nonprofits. She says partnering with local organizations is an added bonus for the students. The class culminates with poster presentations to the client. Student explain his or her poster, the design principles used and their creative process. All posters are loaded onto a thumb drive and are given to the client to use. 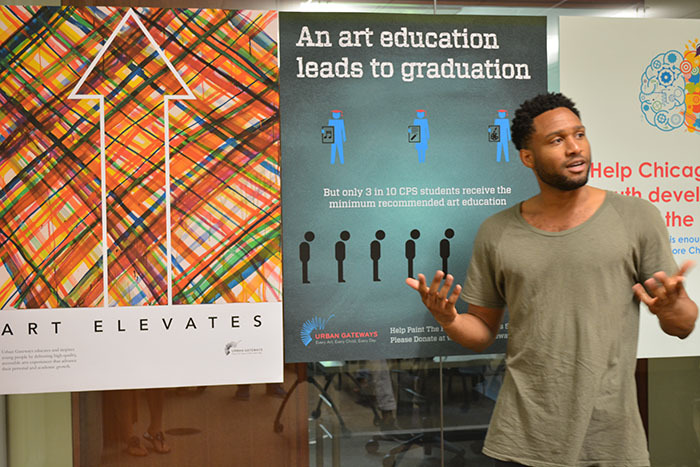 Urban Gateways has already featured several students' posters on its social media channels. The course overall is a win-win for all parties involved: Students hone their design skills and get hands-on real client work; local nonprofits walk away with 60 aesthetically pleasing marketing pieces; and Erin Huizenga gets to impart her knowledge on a new class of eager minds.